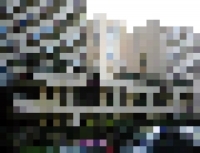 Students in the first year of architectural studies each receive a photo of an urban town scene that has been reduced to the pictorial resolution of 30 pixels in width, as the starting point for a transformational series of exercises. The “photos” will be subjected to analysis as drawings within the range of the picture´s legibility between abstract screens of coloured graphics and still recognizable spatial configurations of the place. The arising vector graphics serve as the basis for designing a spatial structure in digital 3D form. The spatial structures will be materialized from white cardboard and positioned next to each other in a screened modelling space. The models will be conceptually optimized in the contextual association of neighbouring relationships by means of multiple alterations and adaptations. 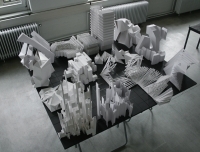 Last of all, the created white model of an “urban district” will be activated visually: three video projectors will be set up around the modelling table for this purpose, which can be controlled as a continuous 360° development from a single computer by means of a special video card. The “built scenery” will be displayed on all sides and visually placed in a dynamic state with this “luminous panorama”. An additional level of information will be implemented in the collective model by means of a stop-motion animation of about one minute. The model´s different sectors will be put in relation with one another. The drawn luminous surfaces are developed directly from the heterogeneous structural features of the different models. The urban district will therefore be created actively and dynamically for about 15 minutes in the series of 13 individual animations which are shown one after the other.